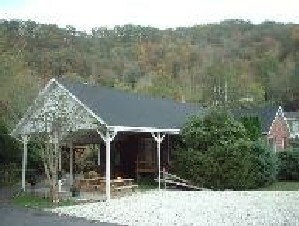 Big Bear Lodge, located in the beautiful ATV friendly town of Gilbert, WV, offers a private setting for our guests. The “Big Bear”, located on Guyan Street, is just 1 of the 4 properties that we offer in our peaceful little town. Once you arrive, you can park your vehicle and ride straight to the trails on your ATV, UTV, or dirt bike! You will have direct access to the Rockhouse Trail System as well as all the local businesses in town. You can ride in the city limits until 11pm, just be sure to be off the trail system by dark. Without having to rush or trailer your ride, you’ll have access to places to eat, fuel up, shop, and more. Be sure to stop by our very own video store, the Movie Hut, to check out the largest selection of Hatfield~ McCoy souvenirs in the State of West Virginia. Also, CLICK HERE to check out our NEW online store!! Three of our properties each have 9 individual beds, sleeper sofas, 2 full baths, satellite TV. All of our properties have full kitchens, coin-operated washer & dryers, gas grills, fire pit or chimnea, and plenty of parking. Our smallest unit has 4 individual beds, sleeper sofa, full kitchen, single bath, and a gas grill. Give us a call now at (304) 664-9516 or email us at moc.V1556071730Wegdo1556071730LraeB1556071730giB@o1556071730fni1556071730 and let us help make your trip to the Hatfield-McCoy Trails the “Adventure of a lifetime! !” We look forward to hosting your next group ride!